Yesterday was a busy day but I thought I can do my Yarn along post a little late too. So to join all the knitting ladies out there sharing their work at Ginny’s Yarn Along, here is what I’ve been knitting and reading this week: I continued knitting on my second Phoebe’s sweater. After a size 2 this time size 4 and in red. 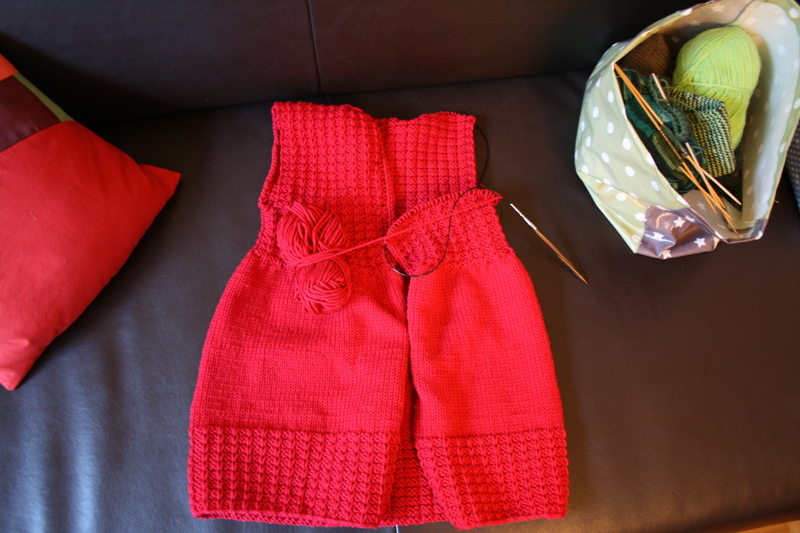 For the body part I have only the second front left over and then I can go on to the sleeves and the hood. It doesn’t knit up as quick as the small one but still especially the upper part goes real quick. I want to finish it in October so I have November for the biggest size and have a stressfree December. 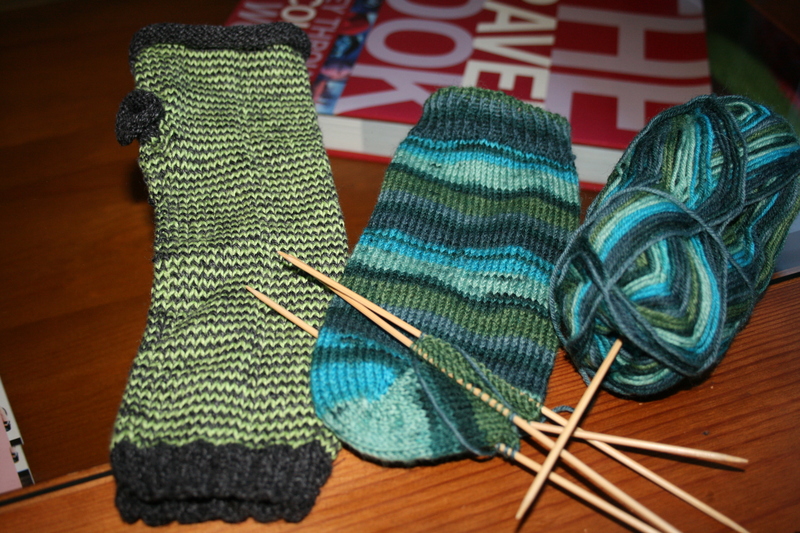 And then I realised that my only pair of simple thin knitted socks was torn beyond repair. So what did I do? Even though I have already a side project with the How We Roll Mitts, I started a pair of simple socks with a sock yarn from my stash and already turned the heel on one of the socks. Well this meant that the mitts fell a bit behind but I did finish one already. Unfortunately I realized after binding off that they are actually a bit to loose for my liking around the fingers. Now I wonder: do I rip back and make them tighter and if so, how much do I rip back? Or do I knit the second one like the first and put them into the charity box because now I’ve seen the first one on myself I don’t think they feel like me that much anyhow (I’m not saying they don’t look super cool, just not like me, you know)? 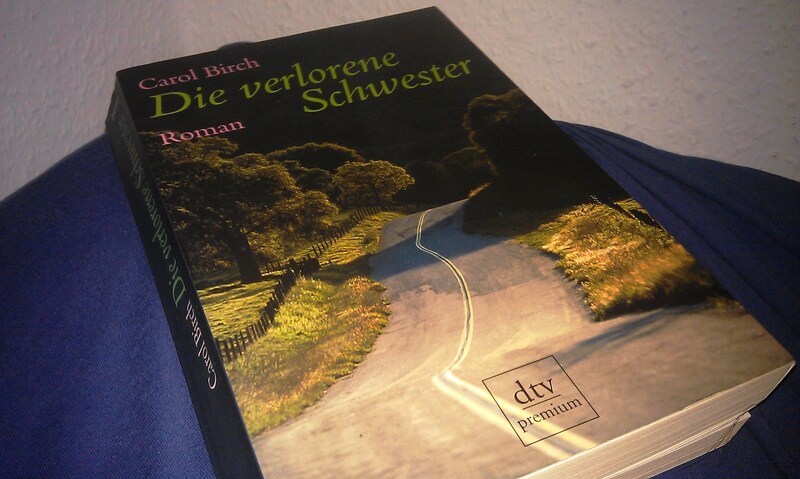 I’m reading a new book called “Die verlorene Schwester” (Little Sister) by Carol Birch. I borrowed it from my parents and it might even belong to my Grandma and if so I guess the person who gave it to her didn’t know what they were giving and mistook it, like me, for a romantic, rather cheesy family story which it absolutely is not. I like it when books suprise me like that because the story is a story about rivalling sisters mixed with depression, drug abuse, AIDS and tragedy that I haven’t understood fully as far as I have read now. Sounds depressing but it is not. It is a really good book about a not so perfect life. Just finished a cardigan, have to finish a sock and shawl that’s been on the needles way to long. Unfortunately I haven’t been doing much reading here lately. Need to remedy that. Love the colors of the socks. Looking forward to seeing the finished hoodie. OK, charity box then it is (or maybe some gets them for their birthday…) Oh yes, cabled or otherwise patterned socks tend to be tighter. But isn’t it annoying if it looks great and there is no mistake and everything but it doesn’t fit? Yes, I think that would be the best idea.